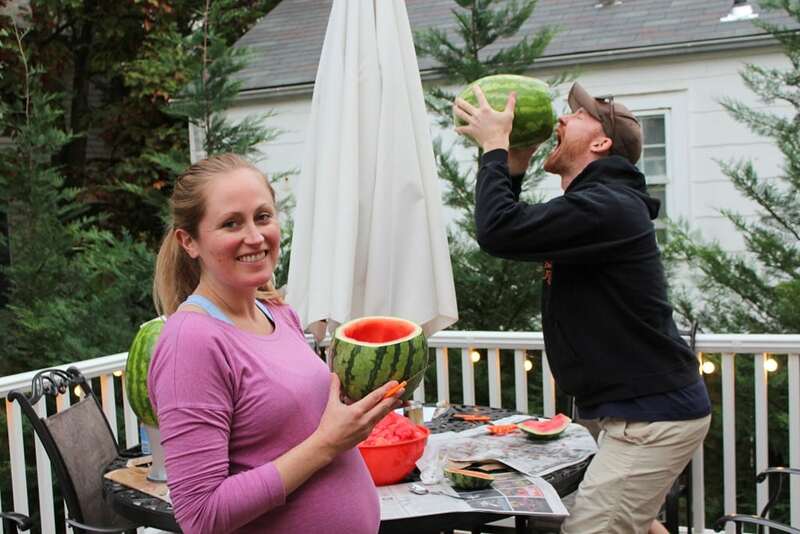 Weekend: Hiking + Watermelon Carving! I kicked off the weekend a little early with a Friday afternoon haircut! 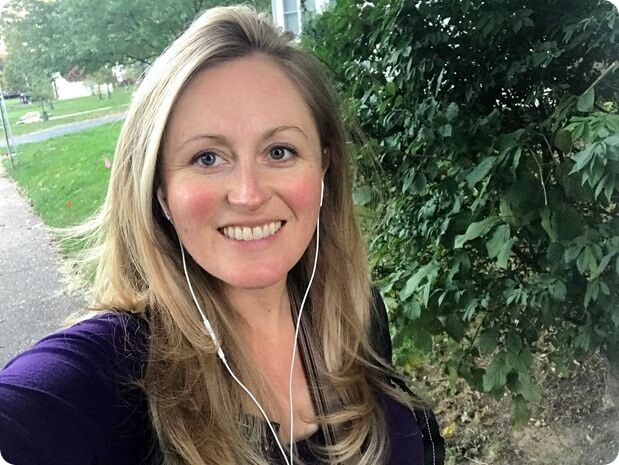 My hair was out of control and I know that once the baby comes it will be hard to get out for stuff like this for awhile… glad to have it checked off the list, and my head feeling lighter. :) I always put off haircuts forever! 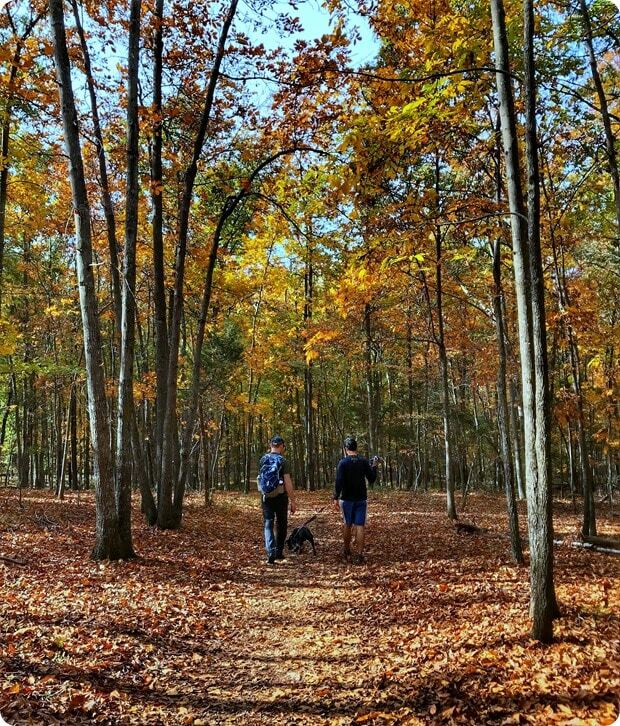 Matt and I met up with our friends Heather and Mike out at Manassas Battlefield Park – there are a ton of trails there and they are dog friendly which is also nice. It was great to catch up with them over some fresh air and movement, and to explore a new spot! 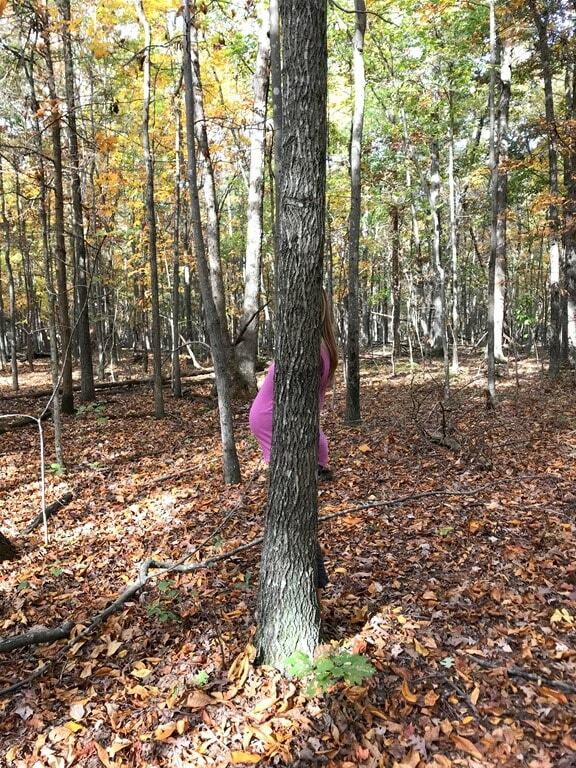 The trails were also all pretty flat, which was appreciated at this point in my pregnancy! And “bump touch.” :) It has been really fun to share this pregnancy journey with my good friend! 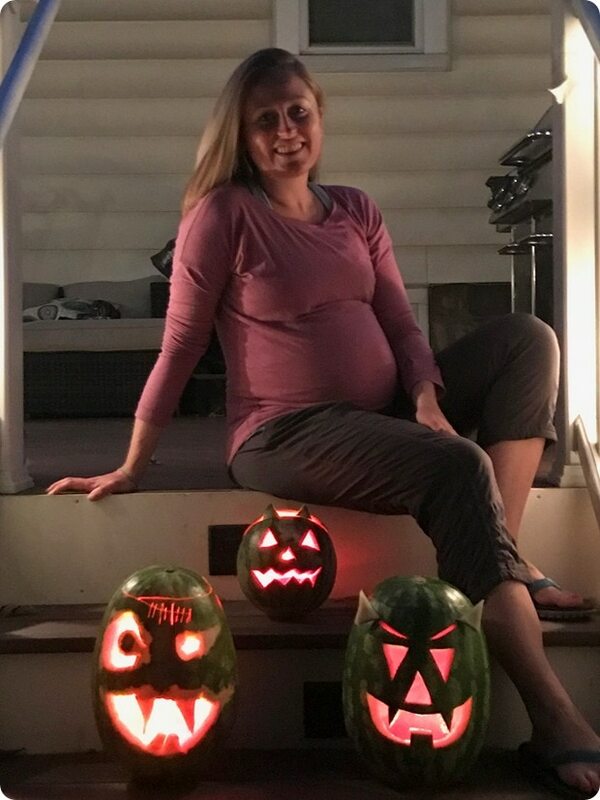 Heather is due in January – just 8 weeks behind us! And then we geared up for a fun adventure: carving watermelons! Yes, you read that right – watermelons, not pumpkins! 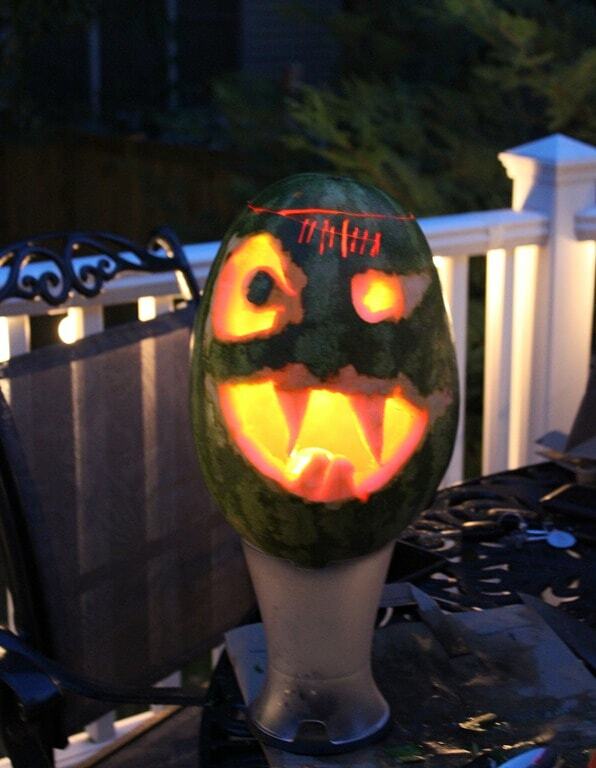 We used a pumpkin carving kit for the carving purposes, but you can also use regular knives. 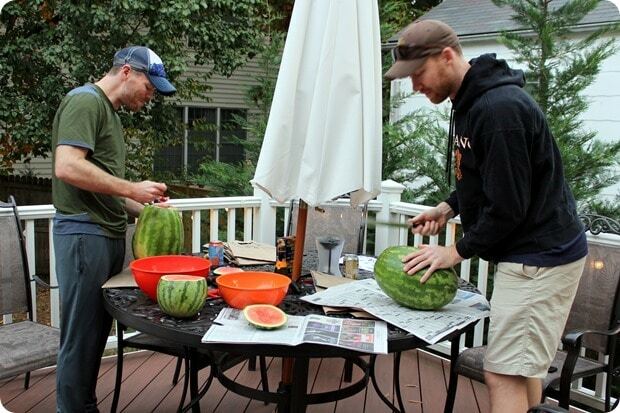 Carving a watermelon was actually easier than a pumpkin – it wasn’t as hard to cut through it! So fun. 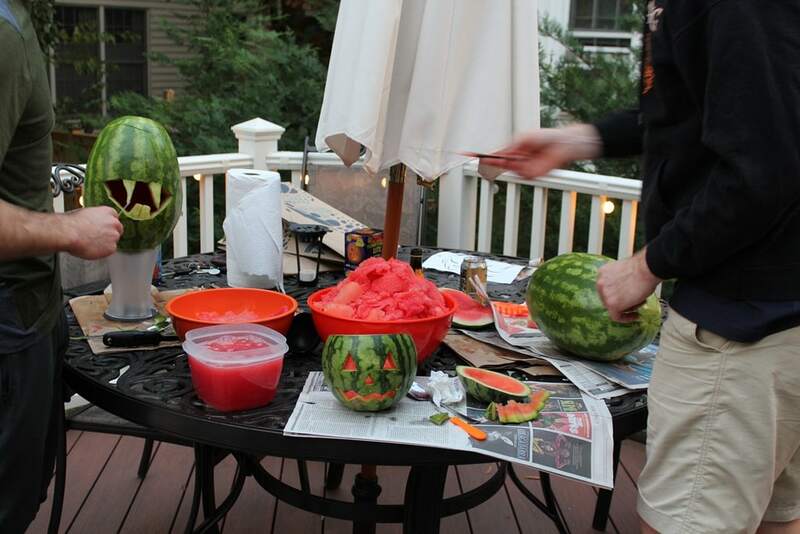 Rather than using a template we just winged it – I carved a mini watermelon and the guys carved big ones. They came out great! Matt always gets so creative with stuff like this – isn’t his cool? He skimmed off a bit of the skin which made it look really neat when lit up. 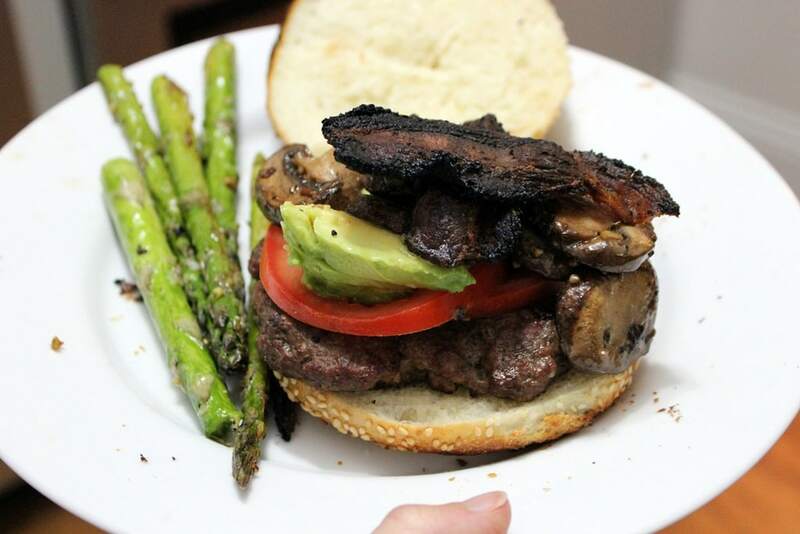 We spent the rest of the night hanging out on the deck – Matt whipped up some awesome burgers on the grill for us (topped with avocado, tomato, bacon, and sauteed mushrooms) plus roasted asparagus. Yum. 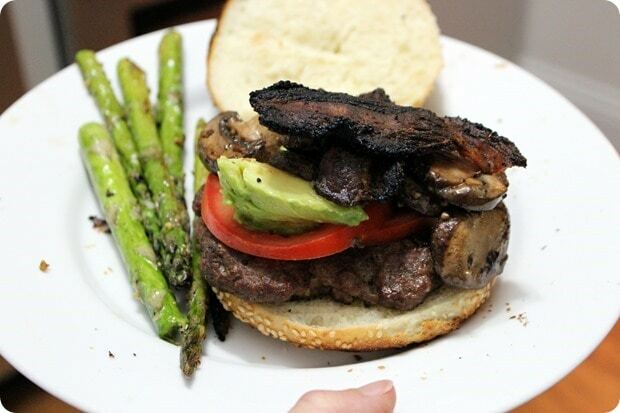 Food and I are still having a tough time this pregnancy, but at least burgers always hit the spot! Shane and I agreed this one was restaurant quality! 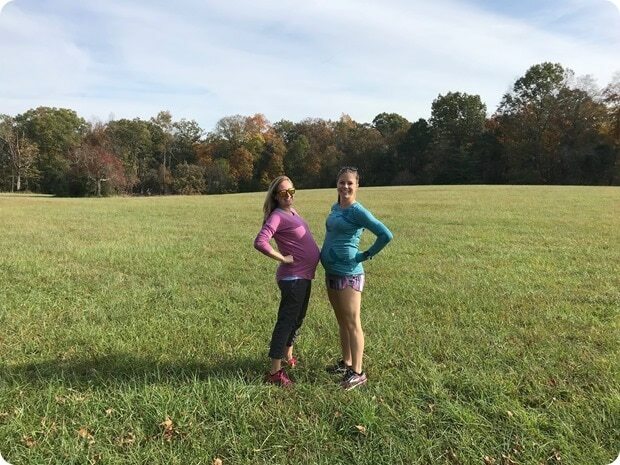 On Sunday, it was rainy but I had a perfect rainy-day morning plan: a prenatal yoga class at Blue Nectar Yoga in Falls Church (via ClassPass <- affiliate link for $40 off). This was only my 3rd prenatal yoga class as the first two I tried ages ago weren’t really my faves (one was at Blue Nectar but on a Saturday a few months ago, and we were smushed in a tiny room and the instructor was okay but not amazing; the other was at Journey Yoga and I really didn’t like the instructor – super bossy and opinionated about all things pregnancy). But, I’m getting to the point where normal yoga is getting pretty awkward and requiring a lot of modifications, so I figured I’d give it another shot. And what do you know – I LOVED this class! We were in the big, spacious room at the studio which was nice, and I liked that we were facing forward like a normal yoga class vs. facing each other, which I find kind of distracting. The instructor was also great – really kind and positive with uplifting and non-judgmental messaging, and I loved that the class was an actual flow. The other classes I tried felt really disjointed in the sense that we’d be doing random squats, then something else random, etc. – it didn’t feel calming in the way that I look for in yoga, you know? Anyway – it’s too bad I found this instructor so late in the game, but I’ll definitely go again so long as the baby doesn’t arrive early. Post-yoga I headed to my track buddy Diane’s house for brunch! 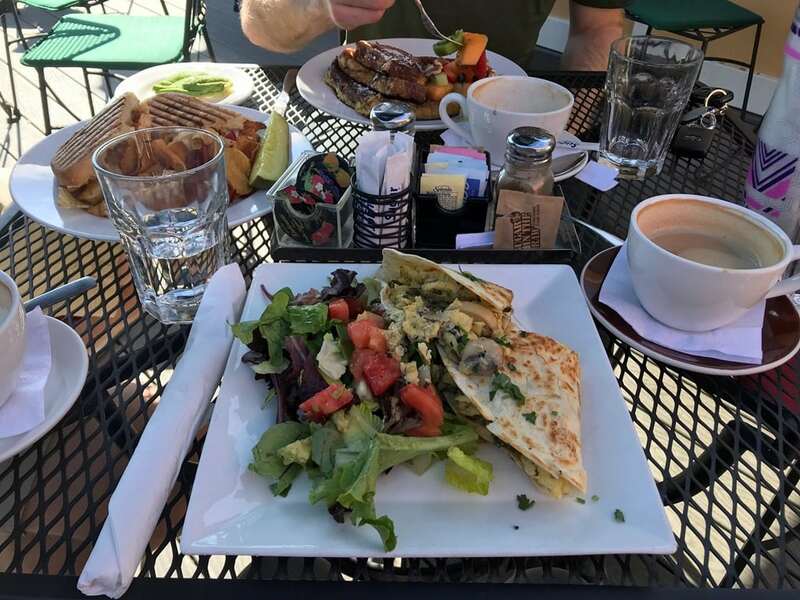 I didn’t get any photos because I was busy chowing down and catching up with her, her husband, and our other running buddy Josh, but it was SO fun. I really miss seeing them multiple times a week for track workouts and our long run dates! Josh just ran MCM and Diane is running Richmond in a few weeks… it will be great to get back out there with them in a few months, hopefully! Matt and I spent the rest of the day doing stuff around the house – still lots of baby-related stuff on our to do list! I was going to pack my hospital bag, but I ended up being really tired after doing some of the other to do list items and we decided watching some Netflix and relaxing was a better idea. I’m working from home today, though, so hoping to pack it later this afternoon once work is wrapped up – the baby could basically come any day now! 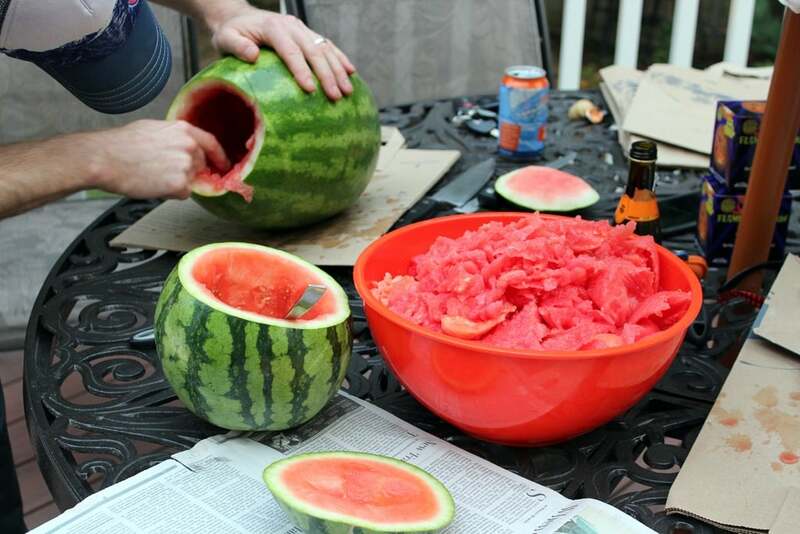 Have you ever tried carving a watermelon? Previous article: Boot Camp, Breakfast + Breech Turning Tips? 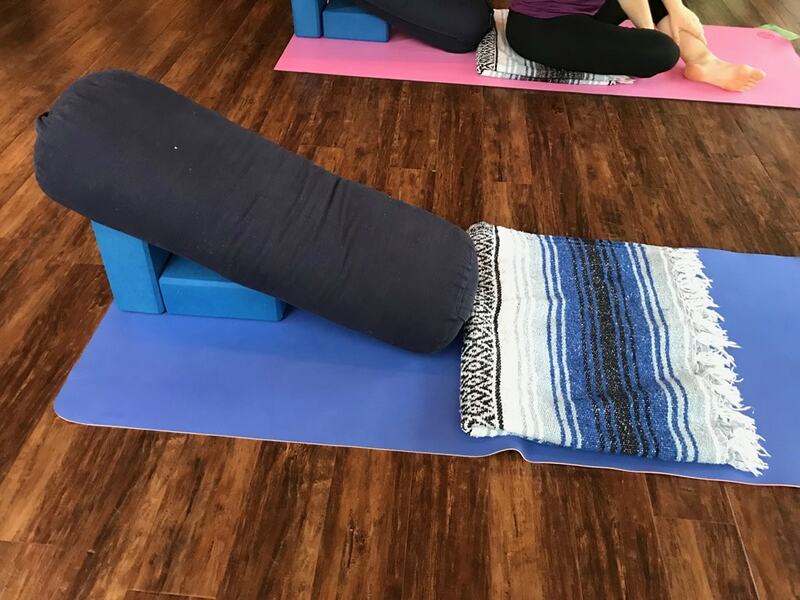 If you are still using ClassPass, I loved my pre-natal yoga class at Flow on 14th St in Logan Circle– the instructor has been there for years and it felt great towards the end – plus a very supportive, non-judgy community. Many of the mamas and I ended up hanging out on leave and still today! Cool, I’ll look into the timing of classes – thanks! Those watermelons look perfect! What a fun weekend with deeelicious food. I wish fall had made its grand entrance here in East TN. We’re in winter now with these temperatures, and unfortunately, the foliage hasn’t changed much. Maybe next year! Good luck with your appointments!! Bummer, hope the weather gets more fall-ish for you guys soon! Those watermelons looks absolutely incredible! Great job to all! What a fun weekend! Your hair looks great. Watermelon carving is SUCH a cute idea!!! I am definitely stealing that from you! Looks like a terrific weekend! All the elements of good fun, especially the creativity with watermelon carving. Good luck with the turning endeavor! 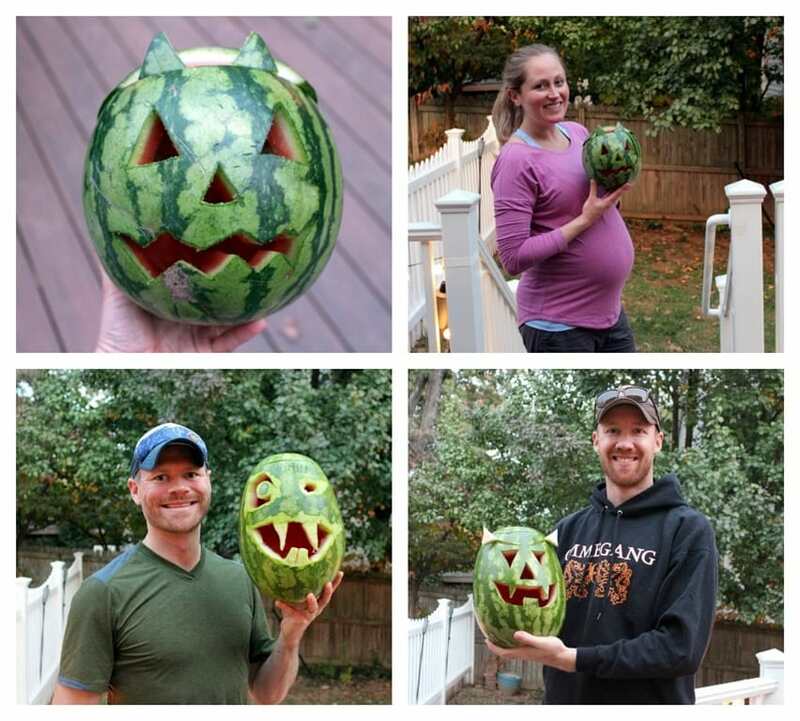 The watermelons looks great! We moved to Arlington in May from the Midwest, so I am really excited that fall feels like it is finally here… time to break out the boots and sweaters. Also- still need to check out Cassatts Kiwi, looks so good!